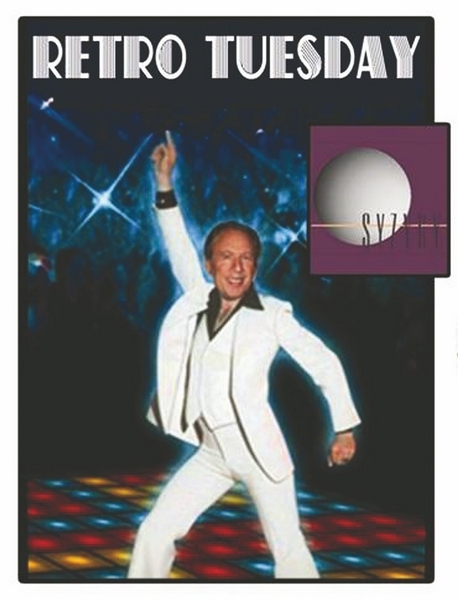 Contributed imageBruce Kallenberg's face is superimposed upon John Travolta's image from the film "Saturday Night Fever" in a promotional graphic for the new Retro Tuesday event at Syzygy restaurant and bar on East Hopkins Avenue. Kallenberg says he's organizing the weekly event to give people a regular place to dance to music from the 1960s, '70s and '80s. ASPEN – Anyone who has lived in Aspen over the past seven or so years is familiar with changes in the quality of musical offerings available locally. Live music has largely given way to the DJ experience, which relies on high-energy dance beats. Even Belly Up Aspen, the area’s largest and most consistent provider of musical offerings, has followed this trend, serving up more DJs and electronic-oriented acts than it did in the middle of the past decade. The stuff pleases younger listeners but sends most adults older than 35 scrambling for more substantial melodic cover. In addition, many nightspots that regularly booked live bands have fallen by the wayside for a variety of reasons, with the result that local musicians tend not to get as many gigs as they used to. Bruce Kallenberg, 71, remembers the not-so-distant time when classic rock and popular tunes of the 1960s, ’70s and ’80s ruled the scene in the upper Roaring Fork Valley. He recently decided to try to resurrect the type of party he used to throw back in the day with Retro Tuesday at Syzygy restaurant and bar on East Hopkins Avenue. The event, which begins at 9 p.m., will rely on DJs, but the music will be what adults prefer to dance to, he said. Kallenberg, a former Wall Street executive, jokingly describes himself as a “frustrated entrepreneur.” He has lived in New York, Los Angeles and Aspen over the years. Facing health issues, he left Aspen for San Diego in 2007 but missed the valley and returned in 2010. “I left town for three years and came back and found that there’s no entertainment for the older crowd, like the people who used to go to the Tippler all the time,” he said, referring to a popular club at the base of Aspen Mountain. The Residences at The Little Nell now occupies the area. Kallenberg said he used to organize parties every so often at the Tippler and other venues such as the now-defunct Crystal Place. He started Retro Tuesday at Syzygy about three weeks ago. “I’ve been experimenting, and by far, Syzygy is the best venue for it other than the Hotel Jerome. I don’t know that I can get the Jerome every single week,” Kallenberg said. Just because the music is old doesn’t mean the event fails to draw youths, he said. “It’s funny. I have a lot of young people who come in. Like my kids, they grew up with that music, and they like it almost as much as the older people do. It’s so much easier to dance to,” Kallenberg said. He said he hopes to make Retro Tuesday a local happening – similar to Open Mic Night at the Red Onion on Monday nights, which often is packed with musicians and music lovers, locals and visitors.